I arrived in Butte late summer 1981. I was invited to a picnic but was not really set up to prepare anything. Someone suggested I swing by the KOA and pick up some food. Seriously? And what? Grab some pork and beans from the shelf of the convenience store? No, get some chicken they said. Like frozen banquet chicken? I soon discovered two things: that jo-jo’s were fried potato wedges and that the KOA Chicken Shack had the best fried chicken IN THE WORLD. The Steele family started the Chicken Shack in 1980 and it is still going strong. It has been run by their family for 35 years and they have no intention of passing it off to anyone else. This is one of the Butte restaurants that I call a “food factory” because they churn out an amazing quantity of food, and it is all fresh. 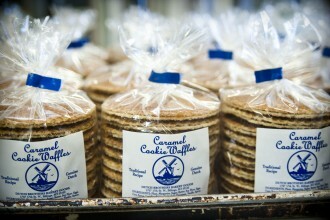 You can order gigantic well-packed trays of food for picnics or reunions, complete with plates and cutlery. And you will go home with lots of leftovers. They cut up their own chicken and batter and fry it for the best burn-your-lips-hot down to the bone moist meat and perfectly crispy-skinned piece of chicken you could ever wish for. The halibut is cut into chunks, dipped in batter, and deep-fried into asteroid-shaped perfection. The jo jo’s are a-plenty, steaming hot inside with a thin, crispy crust and lots of sour cream for dipping. This has been enough variety for me for over 30 years. However, I branched out and tried something new for this blogpost – BBQ Pork ribs so hot and juicy I could barely hold them. They were pure fall-off-the-bone messy, drippy deliciousness. Daily-made sides include cold slaw, ravioli in meat sauce, spaghetti in meat sauce, potato salad, macaroni salad and baked beans with bacon. I think the roll is just for show because it never gets eaten. This is a favorite spot for locals as well as a pleasant surprise for campers at the KOA. You can take your food to go or sit outside on their nice patio with a view of Uptown Butte. 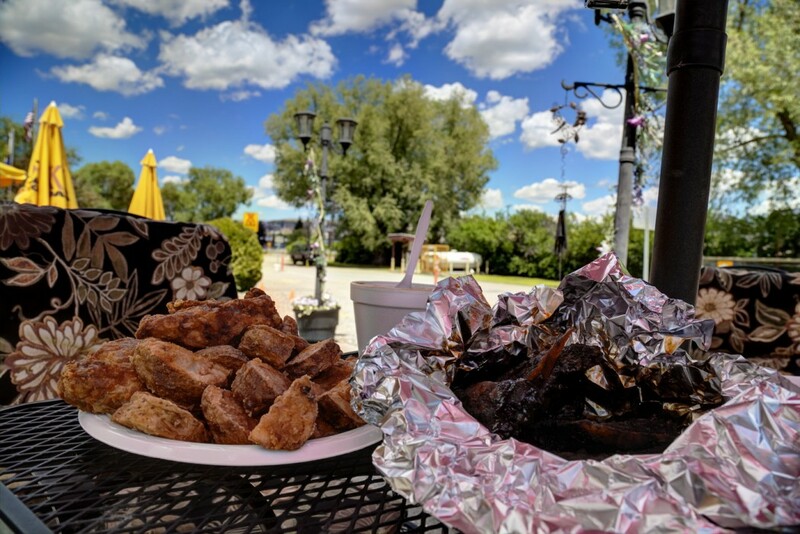 If you are a traveler between Yellowstone and Glacier, or passing through Butte on your way to somewhere else, you gotta stop at the Chicken Shack at the Butte KOA. You can even call in your order in advance. But, be warned this will become a “must-stop” anytime you pass through Butte. 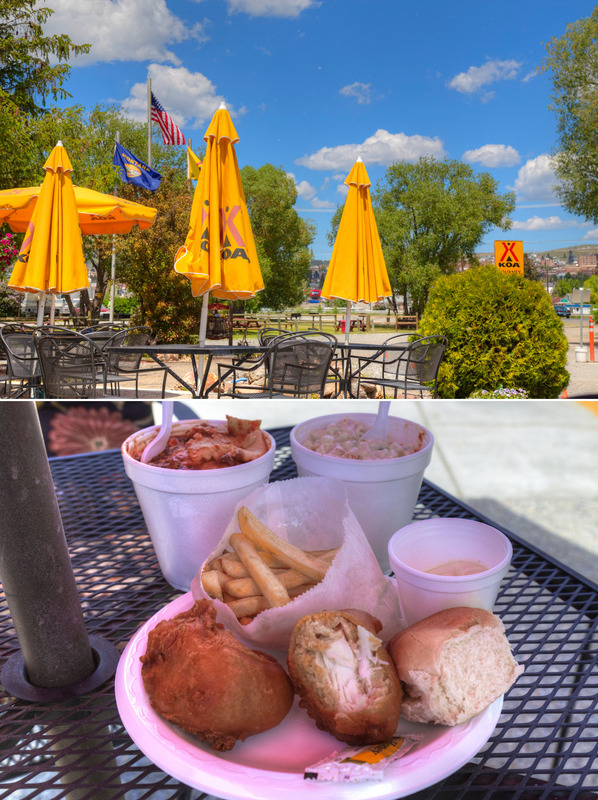 The Chicken Shack is located off the Montana Street exit next to the Visitor Center at the corner of George Street and Kaw Avenue Open 7 days a week.